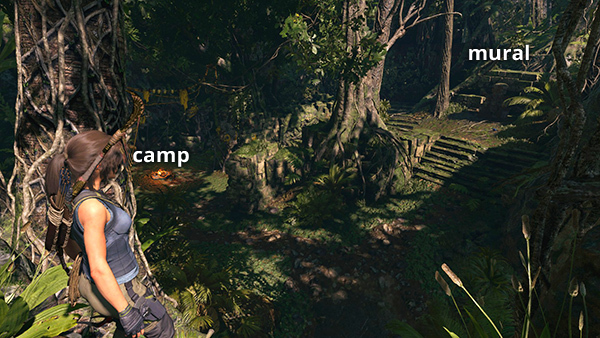 Camps: 6 (Plane Wreckage, Plane Fuselage, Jungle Ruins, Jaguar Den, Canyon Ruins*, Jungle Cavern*) *The 5th and 6th camps are found in the Challenge Tombs and are not counted in the total on the in-game map. We now pick up where we left off before the flashback. Lara and Jonah are on a chartered plane above the Peruvian Amazon. A sudden storm arises, and the pilot, Miguel, is knocked out when a baseball-sized hailstone smashes through the windshield. 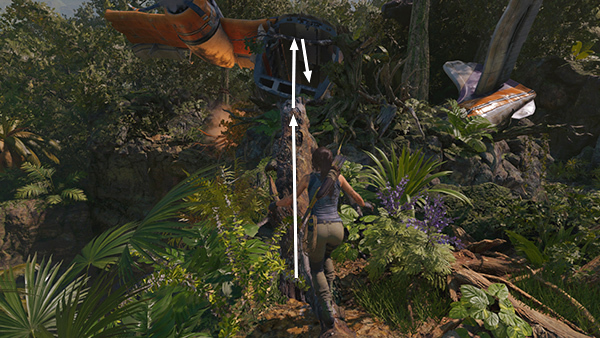 Lara tries to level the plane, but it cracks in half, and she and Jonah are separated. 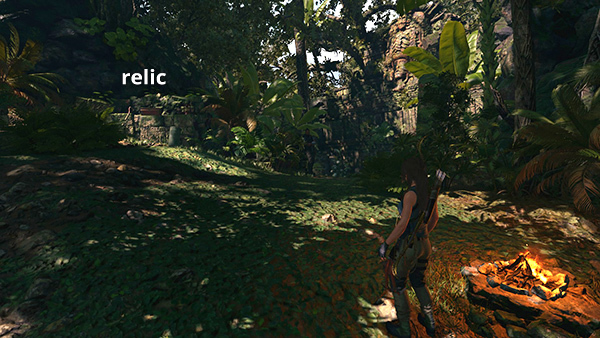 Some time later, Lara regains consciousness still strapped into her seat, which is now wedged into the jungle canopy. She unlatches her seatbelt and falls into the mud, struggles to her feet, and brushes herself off. 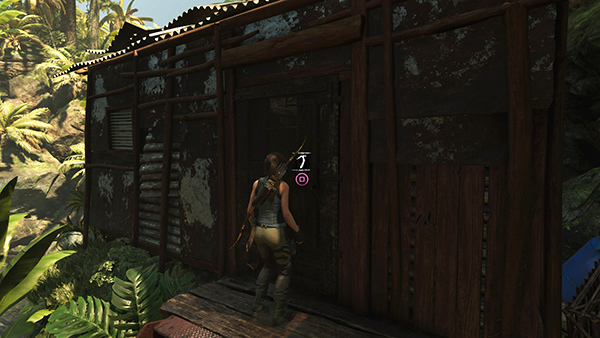 As you begin the level, another photo, Doctor Dominguez, is added to the Artifacts menu, in the Lara's Notebook Story. Without gear or weapons, there's not a whole lot you can do at this point, so make your way toward the objective. Pick some health herbs and gather hardwood by stripping small saplings along the way. 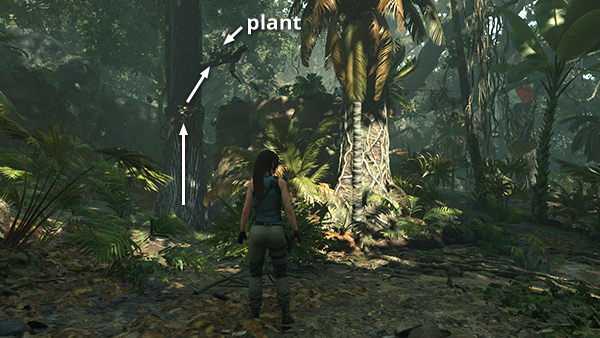 You'll also find some yellow-flowered plants that you'll be able to use for Focus Mixtures once you unlock a the Scales of the Serpent skill. 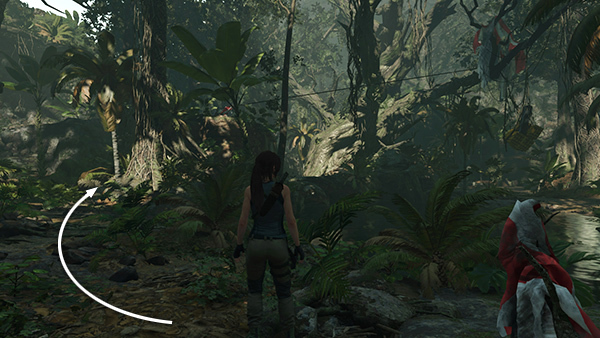 If you get disoriented amid all the foliage, just use Survival Instinct to highlight collectibles, wildlife, and the current objective. (screenshot) Soon you'll come to a low ledge. Climb up to trigger a cutscene. 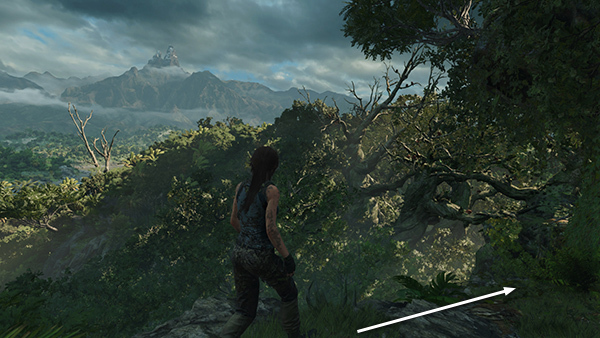 Lara spots a "silver-crowned mountain" in the distance, then sees a flare launched from somewhere below. Continue southwest toward the objective beacon. This takes you along a narrow, rocky path. 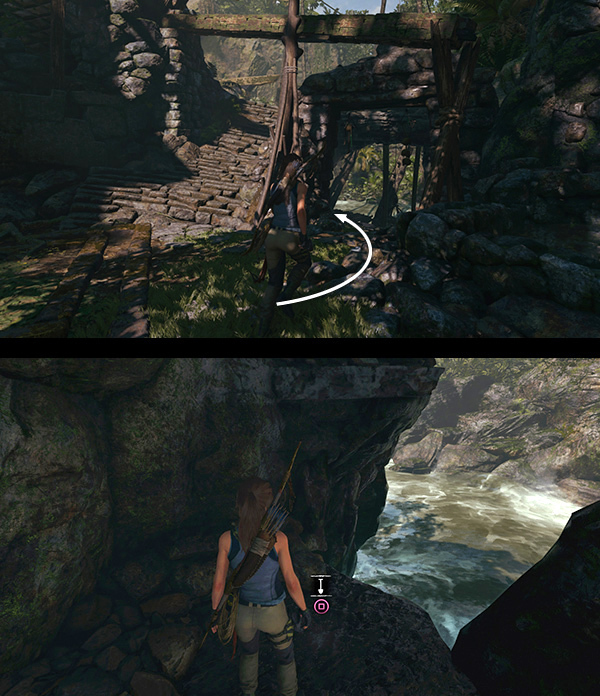 (screenshot) There's a brief scare when the ledge crumbles under Lara's feet, but you'll be fine. Continue forward, jump to grab the tree branch, and pull up. 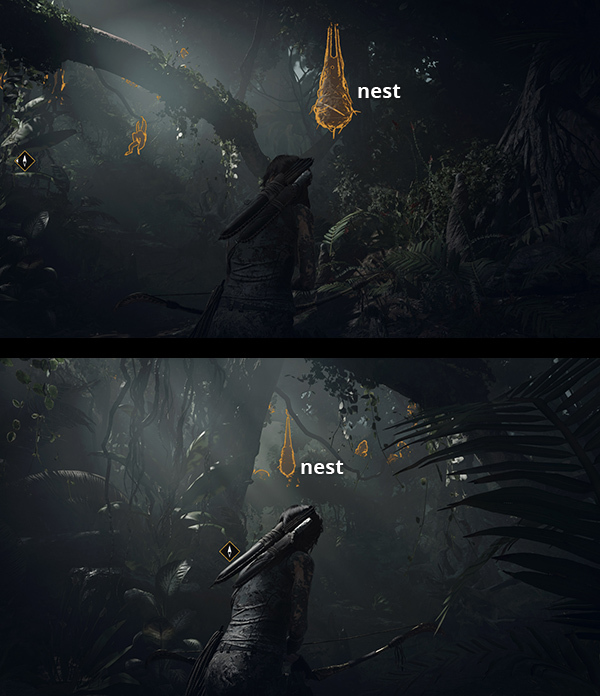 Loot the bird's nest for some feathers. Then jump down to the next ledge and press Interact to hang on. 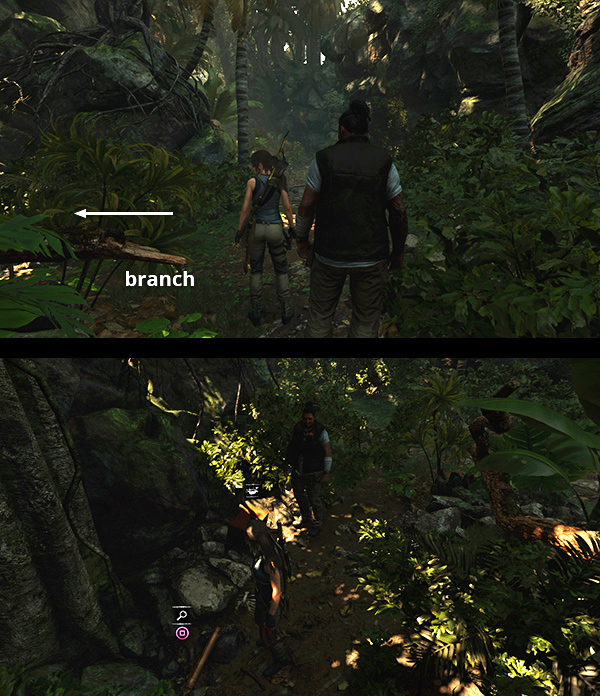 (screenshot) Follow the branch down to the crotch of the monkey tree and pick up some more feathers. Use the next branch to swing across the gap, slide down the muddy slope, then slog through the mud toward the wreckage. Approach the campfire and press Interact to sit down at the Plane Wreckage Base Camp. This opens the Base Camp Menu. CHOOSING SKILLS: At this early stage you only have one option: Skills, but if you've been following this walkthrough you should have earned several Skill Points by now, possibly 4. 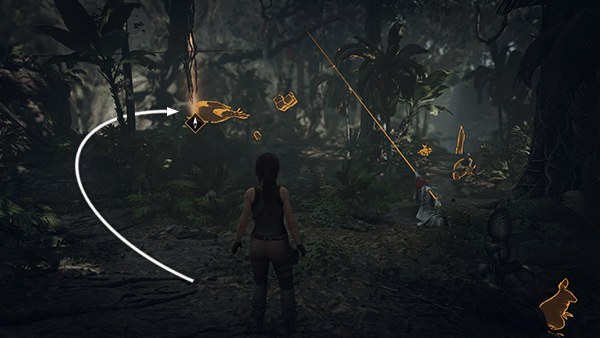 If you open the Skills menu, you'll see a brief overview of the 3 skill types: Seeker (blue) skills enhance Lara's exploration and observation abilities. Warrior (red) skills increase her combat and weapon abilities. Scavenger (green) skills enhance her crafting and stealth skills. The next screen shows the skill tree, which is color-coded according to the three types. The next screen explains skill progression: The skills highlighted in white have already been purchased and mastered. (You won't have any yet.) Skills with colored backgrounds are available, assuming you have enough skill points to unlock them. Skills with black backgrounds can be unlocked by purchasing an adjacent skill. Right now, only the most basic skills—near the middle of the diagram—are available. Use the mouse/left stick to check out the different options before you choose. There's no right answer. Which skills to take depend on your play style and preference. You'll unlock almost all of them by the end of the game regardless. My personal early-stage choices are Puma's Rest (warrior), which allows you to hold charged shots longer, making your bow shots more powerful, and Puma's Charge (the adjacent warrior skill), which costs 2 points and unlocks only after you have taken Puma's Rest. Eagle's Sight (Seeker) reveals Artifacts, Monoliths, Treasure Chests, Archivist Maps, and Explorer Backpacks in Survival Instinct, so it is also very useful. Owl's Wisdom (seeker) reveals Challenge Objects in the same way. If you're following this walkthrough you may not need it, but it can save time. Also, the more collectibles you find, the more points you'll earn toward future skills. Caiman's Speed (scavenger) is also excellent, since it helps Lara swim faster, but you'll earn more Skill Points before you really need it. Whichever skills you choose will come in handy at some point. When you're done choosing skills, exit the Base Camp menu. There's a relic (1/9), Miguel's Flight Log, part of the Myth, Magic & Monsters Story, in a box next to the campfire. 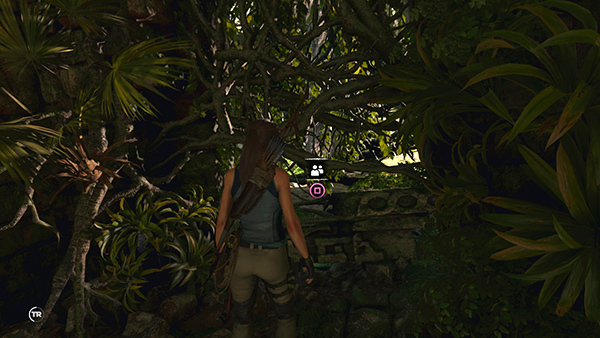 (screenshot) Press Interact, then check the Artifact menu to examine it. There are a few other crafting items you can collect in this area, but you can't loot the dead capybara yet, since you no longer have a knife. Now return to the campsite and head down the slope to the south. 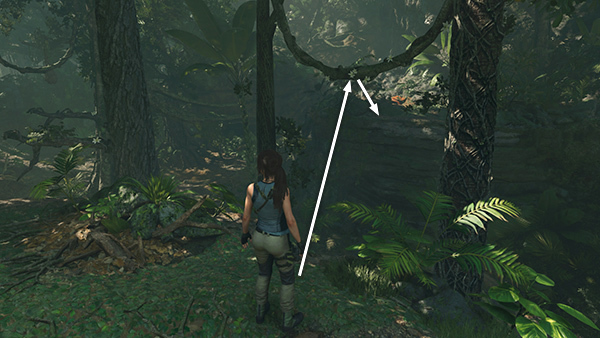 Lara spots her gear hanging from a tree. 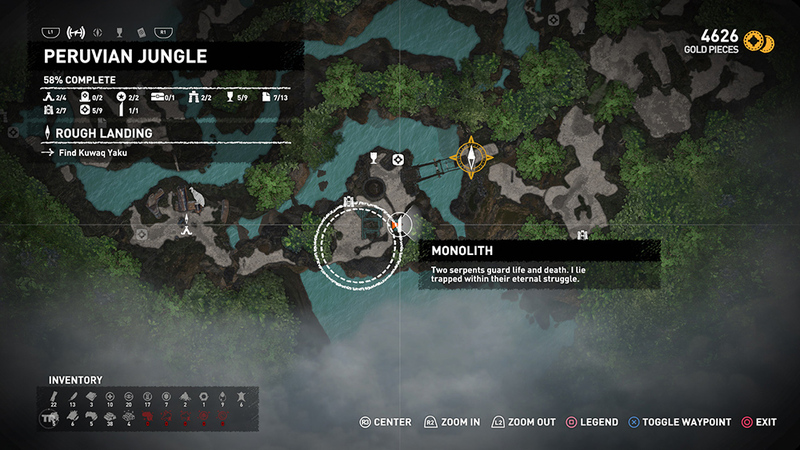 If you check Survival Instinct now, you'll see the Objective Beacon is centered on the wrecked airplane, near the large pool. Follow the left bank of the pool around to the section of the wreckage with the propeller. 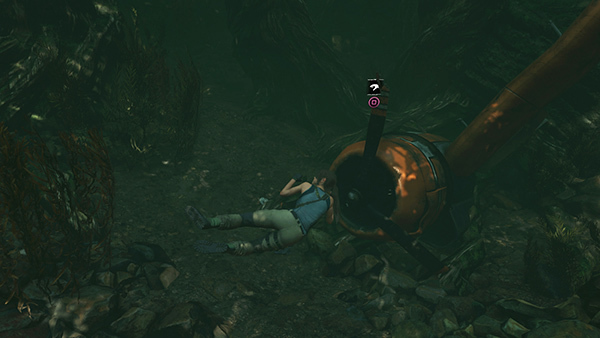 (screenshot) Lara attempts to pry off a piece of metal, but the wreck slips into the water. Swim down to the propeller and press Interact to try and take it. 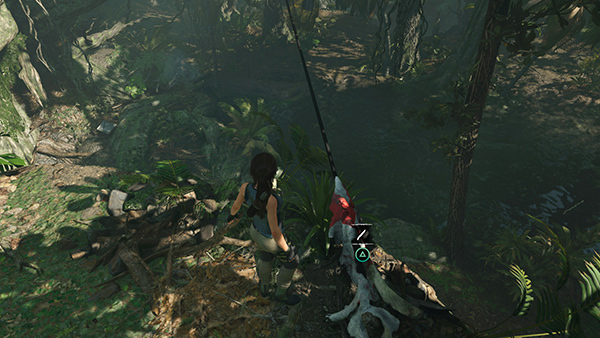 (screenshot) When you do, a moray eel darts in and attacks Lara. Mash Interact to grab a bit of metal from the prop and stab the eel. (screenshot) Then head for the surface. Note that there are a few aquatic plants—both yellow for focus and red for health—growing on the bottom of the pool that you can gather, as well as a supply crate submerged on the southeast of the pool behind the big tree trunks. No need to worry about more eels at this point. When you climb out of the water, your goal is updated. Do that now. The rope is pretty easy to spot: it runs diagonally up from the north bank. Stand hear it and press the Melee button to try and cut it. 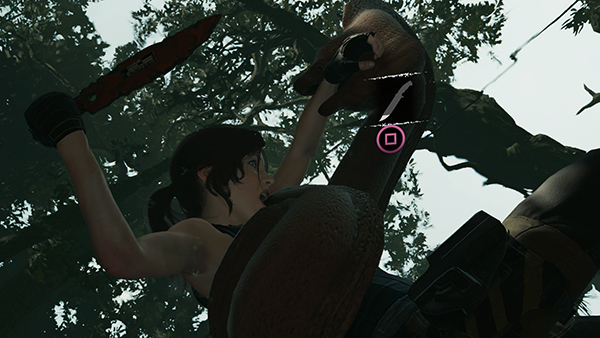 (screenshot) Lara's new blade is too dull. You'll need to fix that. Return to the campfire. If you get disoriented, check the map and/or activate Survival Instinct and look for the Objective Beacon. As you approach, the Base Camp menu opens. Select Inventory. You'll be given the option to upgrade the blade. Hold the button indicated to apply the upgrade. Ta-da! You now have a slightly less janky tool: the MAKESHIFT KNIFE. While you're here, you can also check out the OUTFITS section of the Inventory menu. If you own the previous games or bought one of the special editions that come with bonuses, you should see some extra outfits here. Later during this game, you will be temporarily unable to access to the old outfits, but they will unlock again when you finish the story. You will also find new outfits as you progress. Now you can reach the cargo containers, but before going over there, turn around and jump toward the curved vine to swing over to the next ledge, where you'll find a supply box. (screenshot) Loot it, drop down, and swim across the pool to claim your gear. 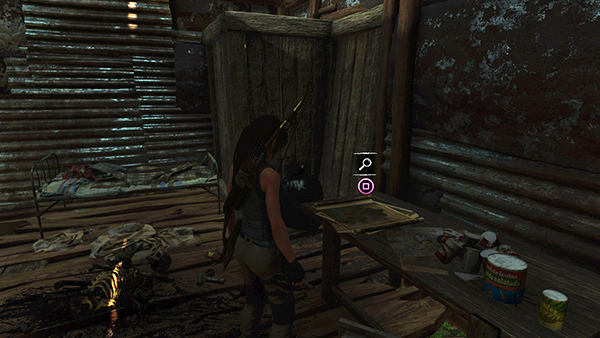 Lara opens one of the boxes and retrieves her RECURVE BOW and walkie-talkie. She hears a voice over the radio and realizes Miguel might still be alive. There's a lot to do even in this early level. From this point on, I will not mention every minor collectible crafting item. If a new item type is introduced, or there's something valuable or easily missed, I will note it. Otherwise, just stay alert and use Survival Instinct now and then to make sure you get everything. HUNTING AND GATHERING RECAP: Be sure to collect any crafting items you notice lying around. You won't be able to use them all right away, but they will come in handy later. Red herbs, for healing, are especially important. Hardwood and feathers are used to craft arrows, which you'll need to survive. You already know how to get wood from small trees, but you'll also come across bundles of sticks, especially as you get closer to civilization. Feathers are sometimes found loose or in nests, but you can also shoot small birds and collect their feathers. If you like, you can hunt capybaras and other small animals for small XP awards, plus hide and/or fat. Technically hunting works just like combat, except in most cases the animals don't fight back. Capybaras will attack if they're cornered, though, so watch out. (You can review bow mechanics and arrow crafting in the previous level.) If you don't like to hunt on principle, that's cool. There are plenty of resources that don't require killing, and later when you get to town, you'll be able to buy certain supplies. CHALLENGES: There are two challenges in this first area. In addition to Flower Picker (introduced above), you can shoot down 4 dangling orpendola nests to complete the Ruffled Feathers Challenge. All of these are in the area around the pool and first base camp. If you've unlocked the Seeker skill Owl's Wisdom, challenge items will glow in Survival Instinct view, making them much easier to spot, but you can also check the map and screenshots. Completing both challenges will earn more XP, and you'll find various crafting items in the process. 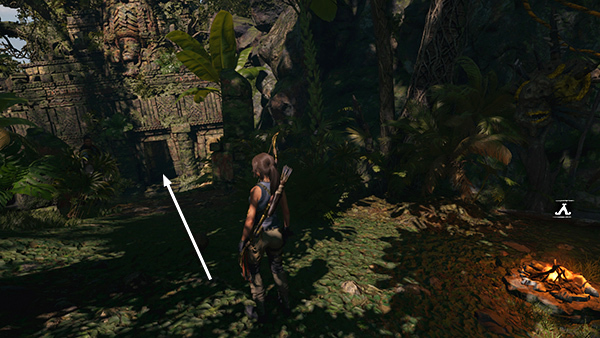 CHALLENGE TOMB ENTRANCE: The entrance to the JUDGE'S GAZE CHALLENGE TOMB is on the north side of this area a bit to the west of the Plane Wreckage Base Camp. You may have noticed the yellow-painted skull decorations while gathering salvage. 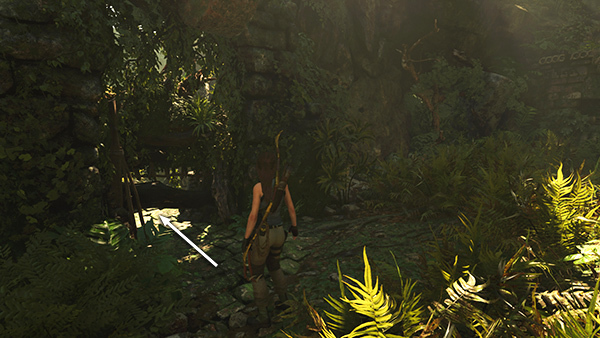 (screenshot) You can check it out but you'll need the CLIMBING AXE to get inside, and Lara hasn't found hers yet. It is covered below. CRYPT ENTRANCE – URQU, THE SCOUT: You can, however, explore a nearby Crypt without any special gear. Follow the streambed out of the large pool toward the northwest. As you approach, you'll notice the telltale flashing light of a survival cache on the rock ledge. 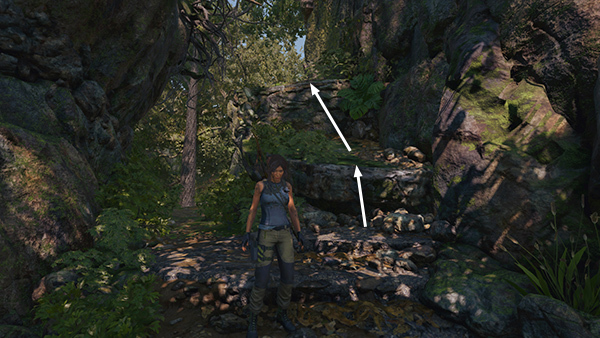 Climb up on the right, follow the ledge to the left, and dig up the survival cache (1/9). Exploring this area also reveals the Crypt entrance on your map. (screenshots) To save space in the main walkthrough, each Crypt and Challenge Tomb will be covered on a separate page. Follow this link for the FIRST CRYPT WALKTHROUGH, which includes 2 documents (1/2 and 2/3), a mural (1/7), sarcophagus containing an outfit component or Vestige: Eveningstar's Boots and 750 gold coins, as well as the archivist map (1/2) for this area. OUTFIT CRAFTING AND WEAPON UPGRADES: When you complete the Crypt, you may want to return to the Base Camp. At this point you may be able to Upgrade the Recurve Bow. The game walks you through the process the first time, but the upshot is that various crafting resources are required to upgrade weapons and repair certain outfits before you can wear them. 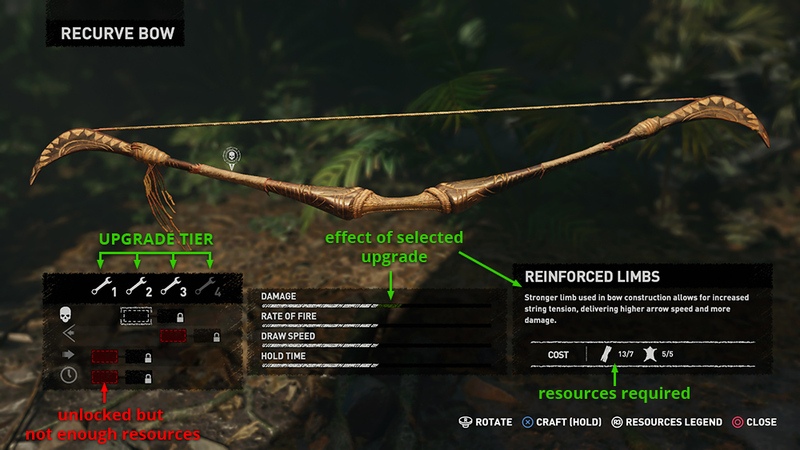 To upgrade the bow, sit at the base camp, open Inventory, then select the Recurve Bow under Weapons. (screenshot) Press the Interact button to open a list of possible upgrades. There are 4 tiers of upgrades (shown at lower left). Some are still locked at this early stage. Available upgrades are outlined in white. 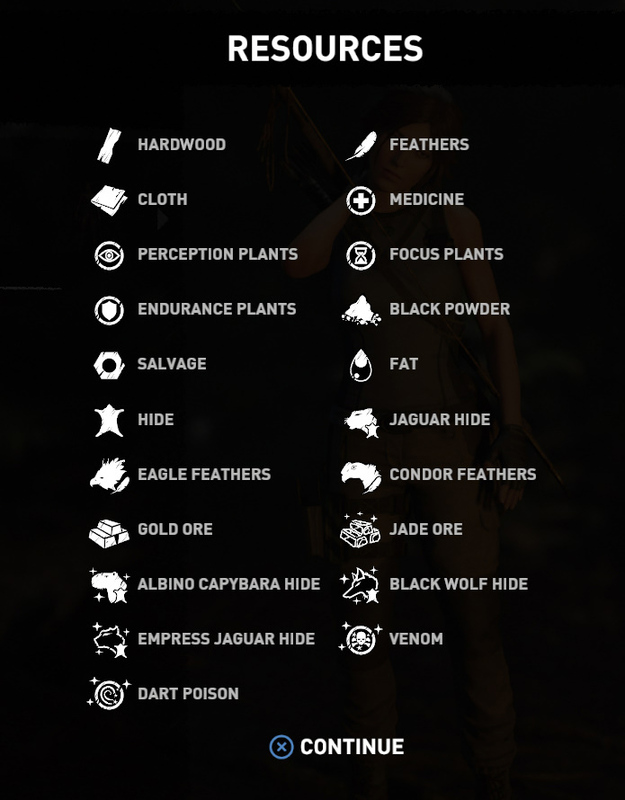 Some are unlocked but unavailable (red outline) until you collect the necessary crafting resources. (screenshot) To apply an upgrade, select it in the box at the lower left then hold the button indicated. The boots you just found in the sarcophagus also need some work before they can be used. Sit at the base camp, open Inventory, then Outfits. Scroll down to the Lower Body section, and highlight Eveningstar's Boots. There's a bit of related lore, then a description of the boots' properties and the resources needed to repair them—in this case 8 cloth, 2 eagle feathers (different from regular feathers used for fletching arrows), and 4 hide. (screenshot) Press the button indicated to see what the various symbols mean on the Resources Legend. (screenshot) You probably already have some cloth and hide, and you may even have some eagle feathers from looting containers and caches. When you gather enough supplies to upgrade the bow and/or boots, you can complete the process at any base camp. A proper Outfits Guide and Weapons Guide are coming soon. 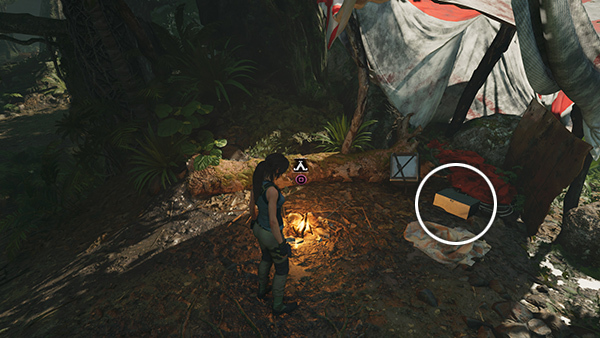 The other nearby documents and relic that were revealed when you examined the archivist map (screenshot) can only be reached after you find your CLIMBING AXES or by approaching later from the other side. This is covered below. 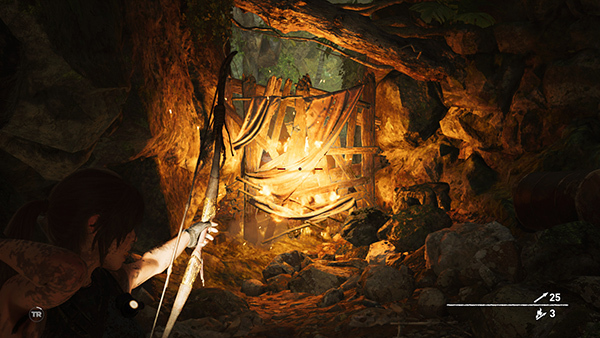 Your next taste of combat is coming soon, so gather herbs/supplies and craft arrows before leaving this area. CROSSING THE RAVINE: Stand near the rope-wrapped post and shoot a rope arrow into the post on the other side of the ravine. Use the line to climb across. (screenshot) Head up the slope to find the signal flare still smoldering amid signs of a struggle. Follow the blood trail up the hill, but take a brief detour along the left fork in the path to find a document (4/13), Sisimite, from the Myth, Magic & Monsters Story. 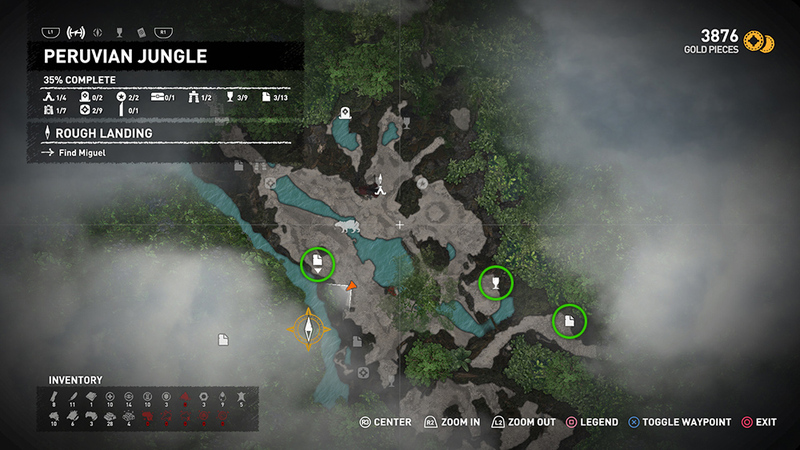 (screenshots) Continue along the path toward the objective, dropping down off a ledge into a slightly lower area with a small pool. 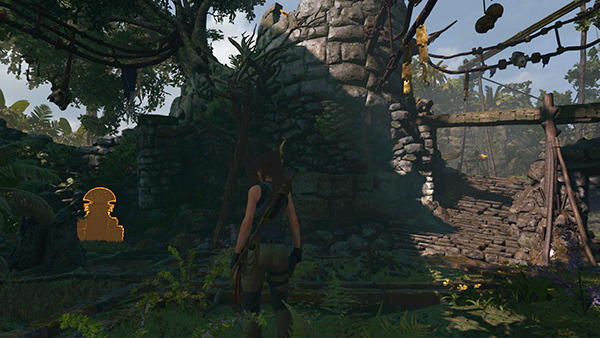 A bit farther on, Lara makes a grisly discovery. A pair of jaguars have killed poor Miguel and now stalk her through the jungle. Follow the path down a muddy slope and through a gap between the roots of a large tree. Move through the undergrowth, climb over a rock ledge, and slide down into a clearing. As long as you manage to defend yourself for a while, an interactive cutscene or quick time event (QTE) kicks in. One of the jaguars tackles Lara and she holds it off by wedging her bow's grip in its mouth. When you see the prompt, quickly alternate pressing A and D on the keyboard or wiggle the left stick from side to side to fend off the attack. 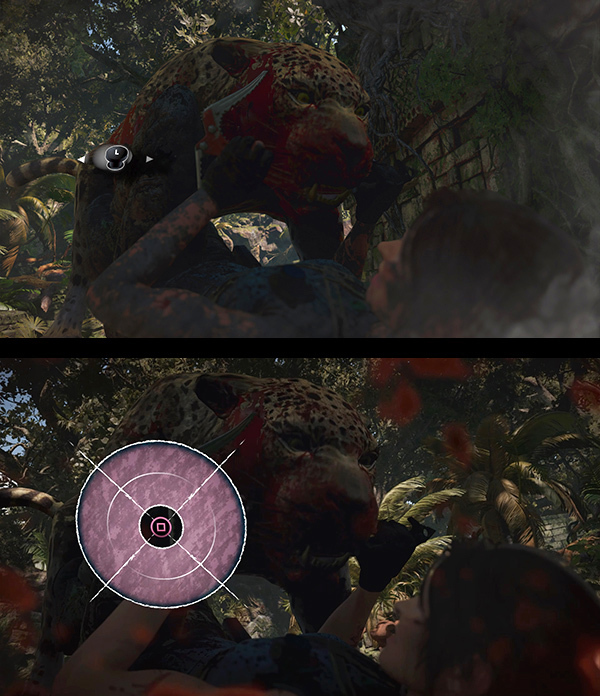 Lara will then stab the jaguar with her knife. 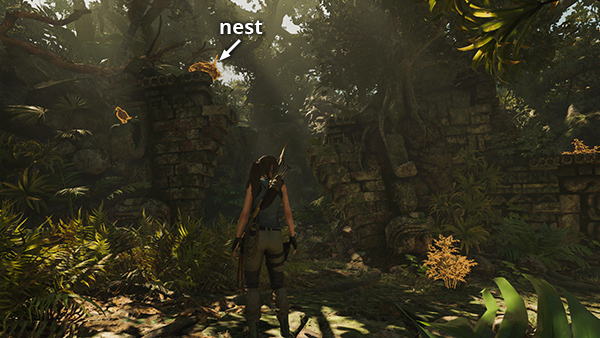 When the first jaguar is dead, its mate approaches Lara, assesses its foe, and decides not to fight. It then drags its mate off into the trees. Continue southwest through a gap in the rocks toward a lovely pool with a waterfall. (screenshot) But before you explore further, head for Jonah and more of your gear. Turn around and climb the rocks on the right. (screenshot) Keep working your way up and around until you come to a fallen tree jutting out toward the wreckage. Walk up the tree trunk, jump to grab the horizontal branch, and swing over to the fuselage. (screenshot Slide down into the campsite to trigger a cutscene. 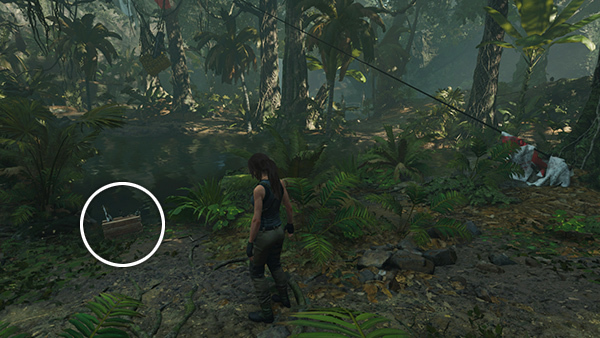 Lara is reunited with her CLIMBING AXES...and Jonah! He's a bit worse for wear, but Lara manages to remove a parasitic worm from his arm. They discuss their current predicament and decide to push on toward the village. 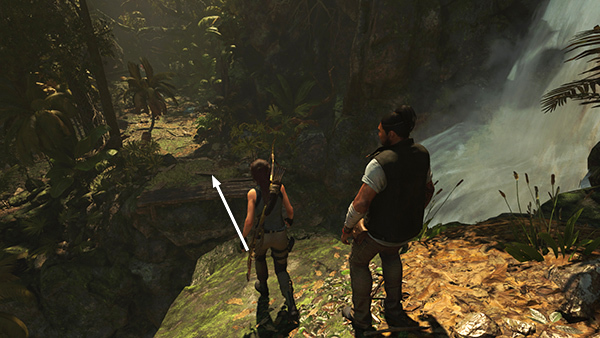 TAIL SECTION WRECKAGE: Lara and Jonah will keep up their conversation after the cutscene finishes, but you can move away from him to explore. Jonah's cool. He'll wait. Gather supplies around the clearing. Then, when the conversation finishes, have a seat at the Plane Fuselage Base Camp. Fast Travel is still disabled, but you probably have a Skill Point or two to spend and some upgrades to make. If you don't have a preference, I recommend taking the Puma's Brace Warrior Skill, which helps Lara resist damage after healing during combat. It costs 2 points, but if you're combat-challenged like I am, it's worth it. SECOND CRYPT ENTRANCE – RIMAK, THE STORYTELLER: There's another crypt hidden nearby. Like the Challenge Tombs, these are optional for story purposes, but you will need to explore all of them for 100% completion. Follow this link for the SECOND CRYPT WALKTHROUGH, which includes a survival cache (5/9), 2 relics (4/9 and 5/9), a mural (2/7), another outfit component, Vestige: Eveningstar's Cape, 750 gold pieces, and and a document (7/13). RETURN TO THE BASE CAMP: When you've finished exploring the Crypt, head south toward the pool and wreckage, but before you reach the water, look to the left to find the ledges you climbed earlier. 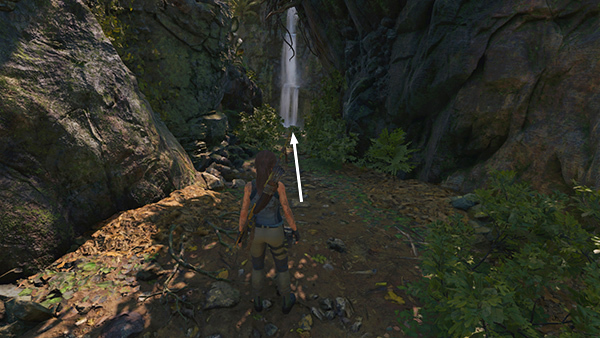 (screenshot) Retrace that same route up and around to the top of the hill. Then use the branch to swing over to the plane and slide down through it to the campsite. At this point, you're probably better off putting your resources into upgrading your bow, but If you sit at the fire and open the Base Camp Menu, you can also check out your new cape under Inventory > Outfits > Upper Body. You may even have enough resources to repair and equip it, but it won't be useful until you unlock the Eye of the Eagle skill, which lets you use Perception plants. That will happen soon. CONTINUING TOWARD KUWAQ YAKU: Head down the path to the southeast. The heavy wooden barrier requires two people. (screenshot) On the other side, they spot the village in the distance. Follow the path down to the left. When you come to the ledge that is most definitely not a path, just hold Right to sidestep along until you reach the other side. 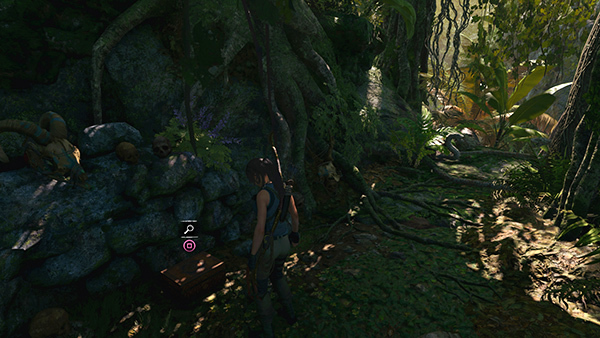 NOTE: Unlike regular survival caches, which can be spotted and excavated even if you haven't found the explorer backpack that reveals them on the map, you must first decipher a monolith before the treasure will appear. 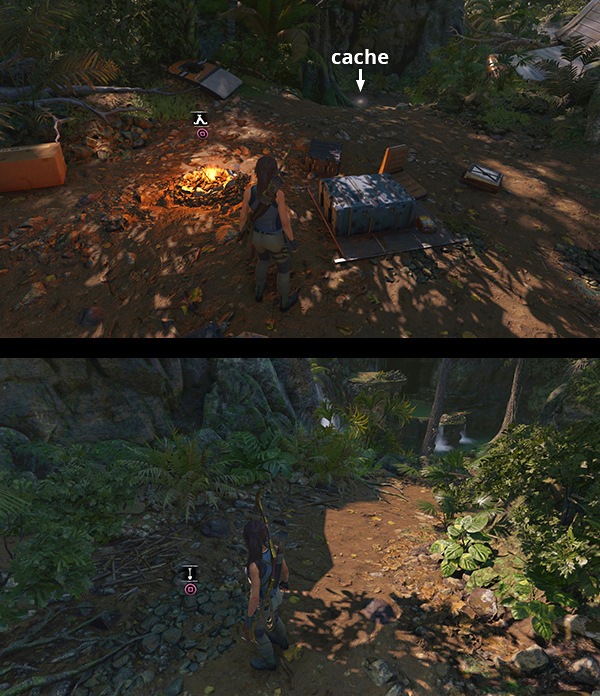 The contents of each cache is random, but monolith riches generally include rarer resources. 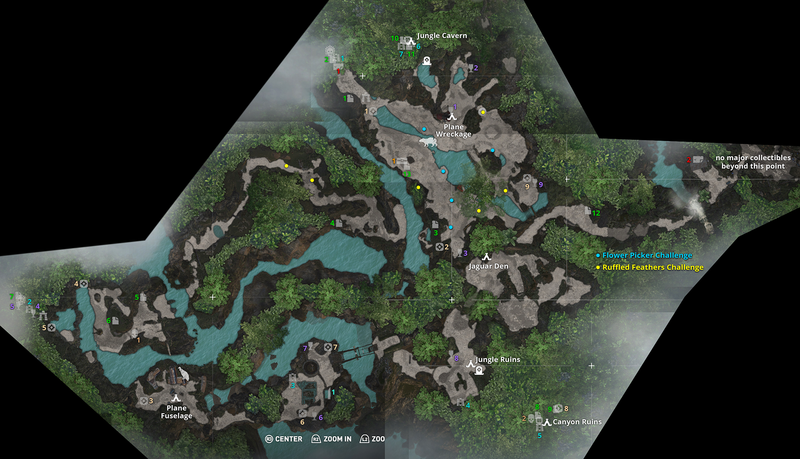 Again, check the Map Legend and Survival Guide for details. 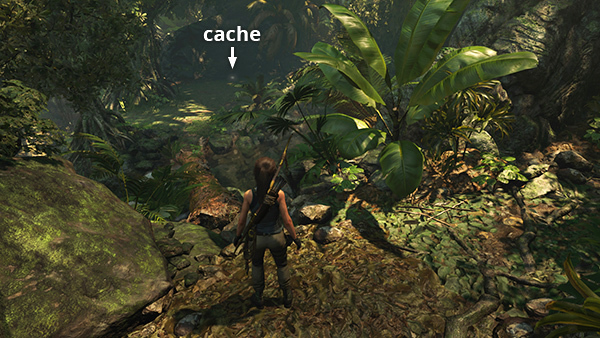 BUG NOTE: There's a common bug in which players examine a monolith only to find the related cache does not appear where it's supposed to be. Fortunately this appears to have been fixed, so if you're having trouble be sure you've installed the latest updates. If it's still happening, contact Square Enix Support. UNDERWORLD GATE CHALLENGE TOMB ENTRANCE: If you're playing on one of the easier difficulty settings, the game will notify you of a Challenge Tomb nearby. You can also recognize it by the yellow painted decorations. Go ahead and have a look. Jonah will chill here while you explore. Follow this link for the UNDERWORLD GATE CHALLENGE TOMB WALKTHROUGH, which includes the Canyon Ruins Base Camp, an explorer backpack (1/2), 2 documents (8/13 and 9/13), a survival cache (8/9), a mural (5/7), and a tomb stele which unlocks the Seeker Skill Eagle's Perch. Challenge Tomb skills are unlocked automatically. You don't need to unlock them at a base camp. This particular skill works passively; i.e., you don't need to do anything special to use it. 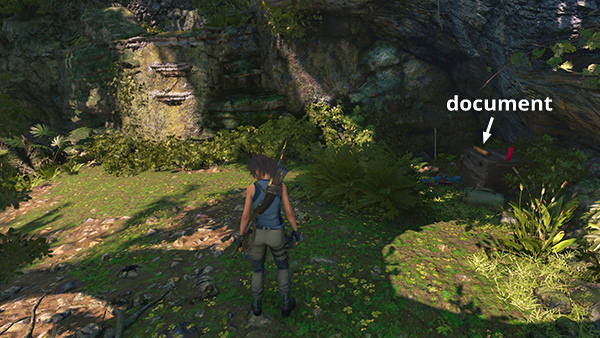 Lara will just automatically climb faster. However, you may want to stop at the camp to spend Skill Points you've earned and/or upgrade your bow and outfits. Just be sure to save some wood for arrows! 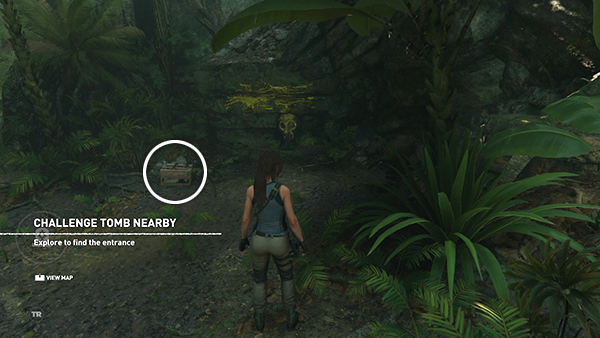 NOTE: Finding the backpack on the way to the tomb reveals the location of several collectibles on your map, including the one treasure chest in the level, which is back in the first area, near the Plane Wreckage Base Camp. 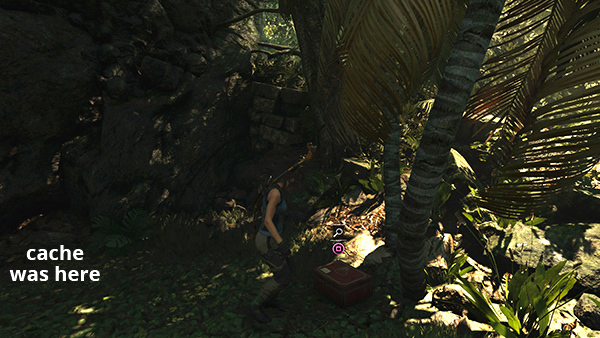 Treasure chests require the LOCKPICK to open, so we'll retrieve later. See the section on REVISITING THIS LEVEL, below. 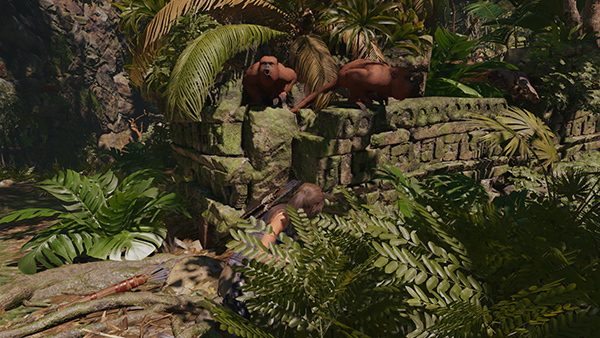 Lara and Jonah open the barrier together and Lara crawls through, but before Jonah can join her, a jaguar attacks Lara from behind. Jonah tosses her his flare gun and urges her to use it. JAGUAR ATTACK: The fight begins with a brief QTE. 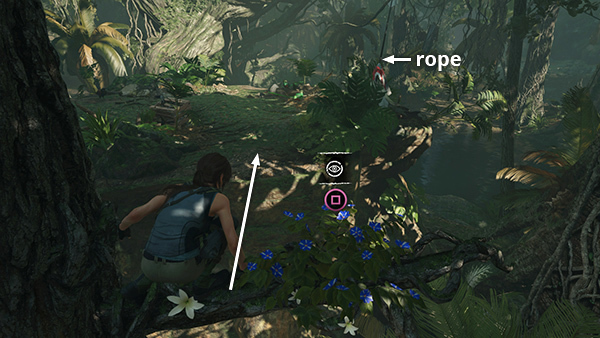 When you see the targeting reticle, use the mouse or right stick to aim at the jaguar. Then when the reticle turns red (screenshot), fire as usual (Left Mouse/Right Trigger). This repels the big cat but only for a moment. Now you have a fight on your hands. Use the same skills you did during the fight with the two jaguars earlier. When it attacks, tap Drop/Roll (C/Circle/B) to evade. Shoot at it when you have the opportunity and keep moving so it doesn't corner Lara. 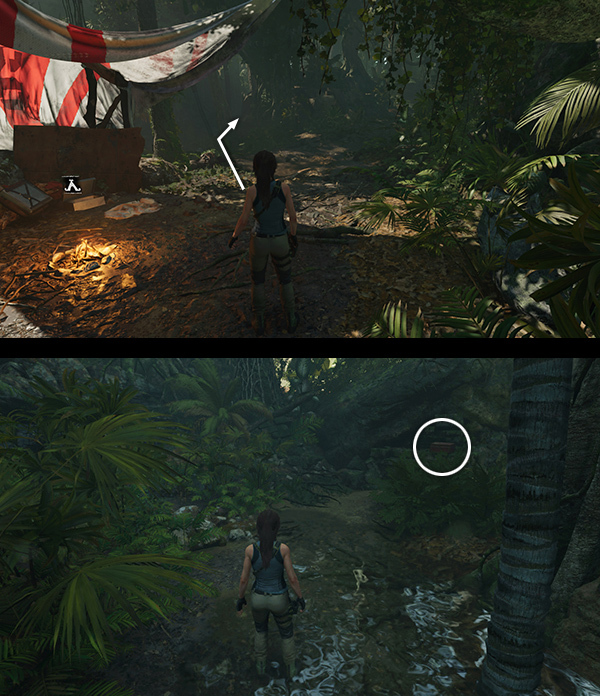 If Lara is injured you can heal on the run by pressing F1 on the keyboard or holding L1/LB on the controller then pressing X/A. There are a few red berry bushes scattered around the area if you need medicine, but hopefully you've been stocking up as you go. The 2 monkeys cheering from the sidelines like they're at a WWE match are no help. 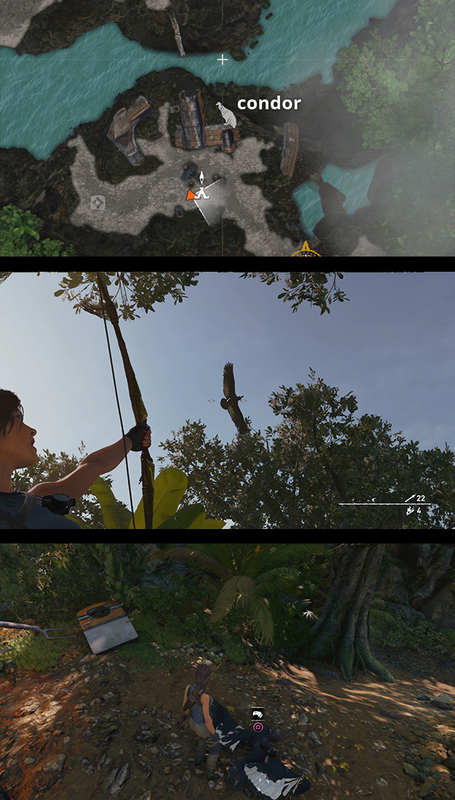 (screenshot) Try to ignore them and just focus on getting as many arrows into the jaguar as possible. 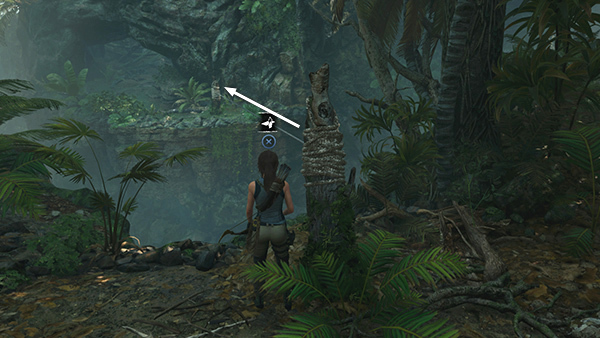 If it does manage to pin Lara down again, this triggers another QTE, in which you are prompted to wiggle the left stick back and forth or alternate pressing A/D on the keyboard to hold it off with your axe. Then a circular icon appears with a symbol for one of the controls. The outer ring will gradually contract. 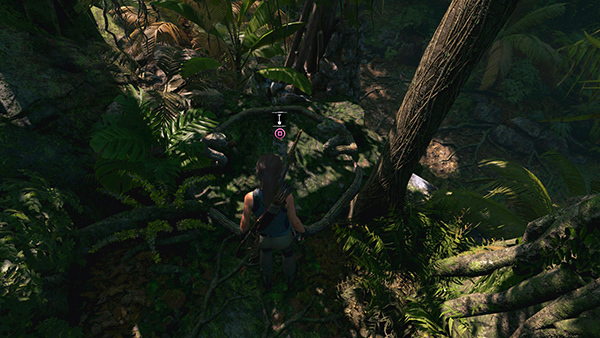 Press the button indicated (it may be Interact or Melee so pay attention) before the ring reaches the center in order to whack the jaguar with the axe. 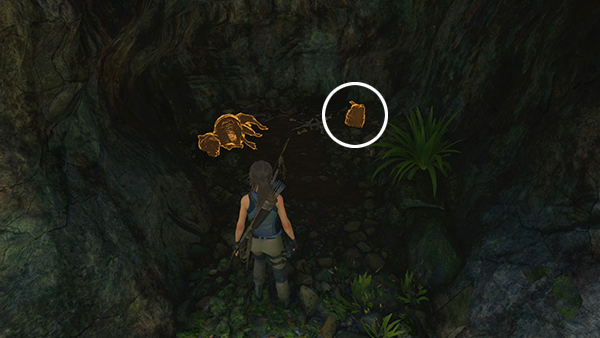 (screenshot) If you press the wrong button or press the correct button too late, you'll fail the QTE and Lara will be cat food. Continue evading and shooting until the jaguar falls. Return to Jonah to trigger a longer cutscene, in which they sit by a campfire talking and Jonah tends to Lara's injuries. Bringing up memories of their very different yet somehow similar childhoods leads into a flashback sequence. NOTE: Follow this link for the separate CROFT MANOR WALKTHROUGH. 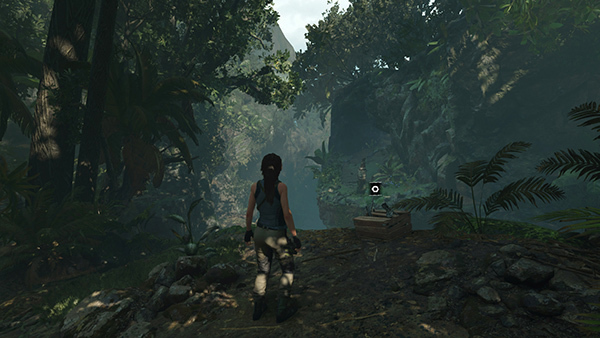 BACK IN THE JUNGLE: When you finish the Croft Manor flashback, you are automatically returned to the Jaguar Den Base Camp and prompted to look at your outfits. 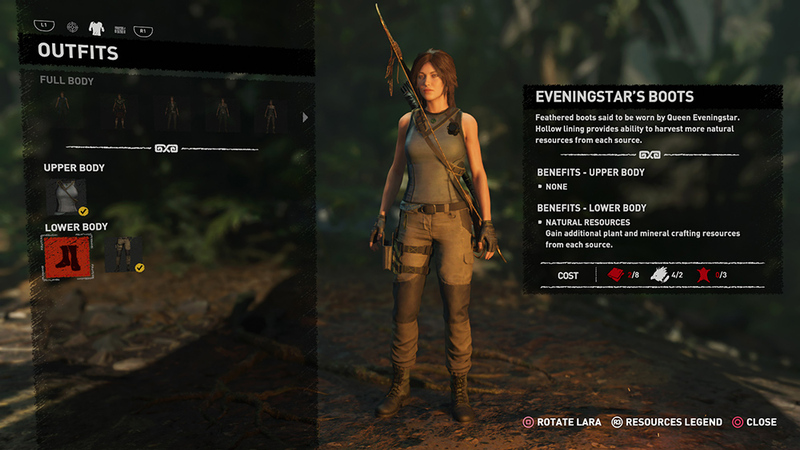 You will have unlocked the Vest of the Empress Jaguar (reduced enemy awareness) and Boots of the Empress Jaguar (quiet movement), which Lara apparently sewed herself the night before. 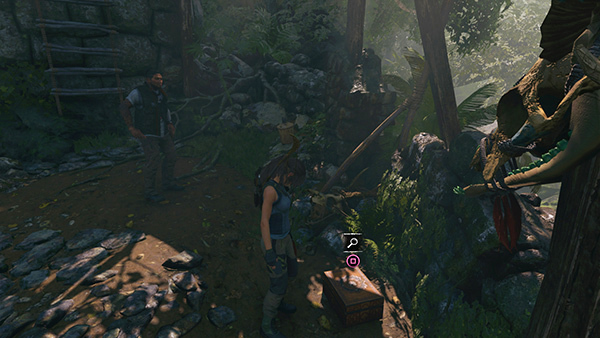 You can also equip any Vestige items you found in the crypts and restored and outfits you've unlocked as DLC or by playing Rise of the Tomb Raider. Of course, you can also stick with the default outfit. You may also want to upgrade the bow or spend a Skill Point or two. BACK TO THE START (optional): If you move out onto the ledge overlooking the area to the north, you'll realize you've come full circle. 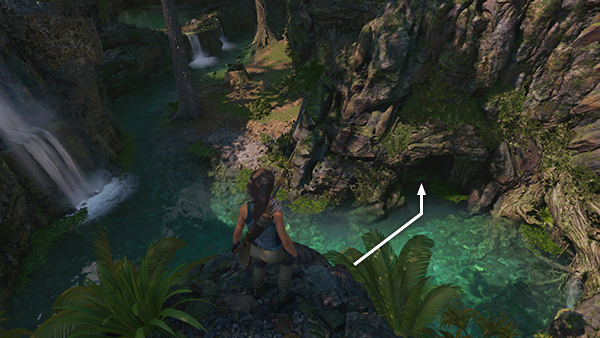 The pool where Lara found her bow and the Plane Wreckage Base Camp are just to the north. There is now a hanging vine for moving back and forth between the two areas. You can now go back and raid that Challenge Tomb. NOTE: Until you get the LOCK PICK, you won't be able to open the treasure chest, even if you discovered the explorer backpack near the Underworld Gate Challenge Tomb and revealed the chest on your map. The chest and the nearby document are covered below under REVISITING THIS LEVEL. BUG NOTE: I recommend completing the challenge tomb during your first pass through the level, since a bug may prevent you from unlocking the skill you would normally earn by completing it. As far as I know, this only happens in the PC version, but better safe than sorry. For details see the footnote. 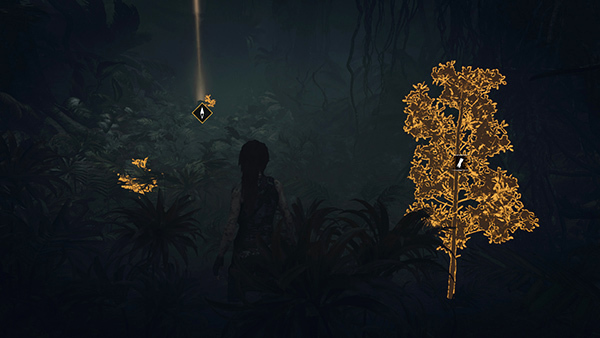 Follow this link for the JUDGE'S GAZE CHALLENGE TOMB WALKTHROUGH, which includes the Jungle Cavern Base Camp, 2 murals (6/7 and 7/7), 2 documents (10/13 and 11/13), and a tomb stele that unlocks Caiman's Heart, a Scavenger Skill that makes Lara's health regenerate more quickly. NOTE: If you prefer, you can also use the Base Camp Menu to Fast Travel back to where you left off. To do this, sit at the campfire to open the menu. Select Fast Travel to bring up a world map showing other base camps where you could go. 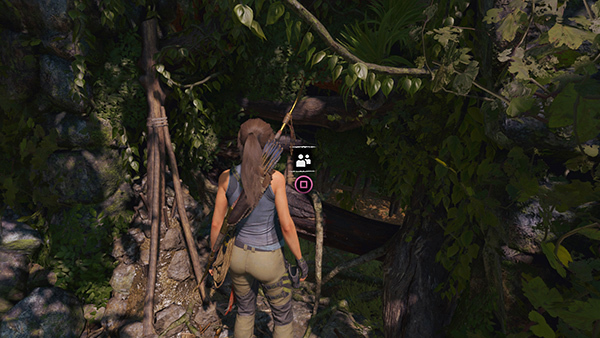 You'll notice the Jaguar Den Base Camp has a little diamond icon above it, indicating this is the last camp you visited as you progressed through the story. 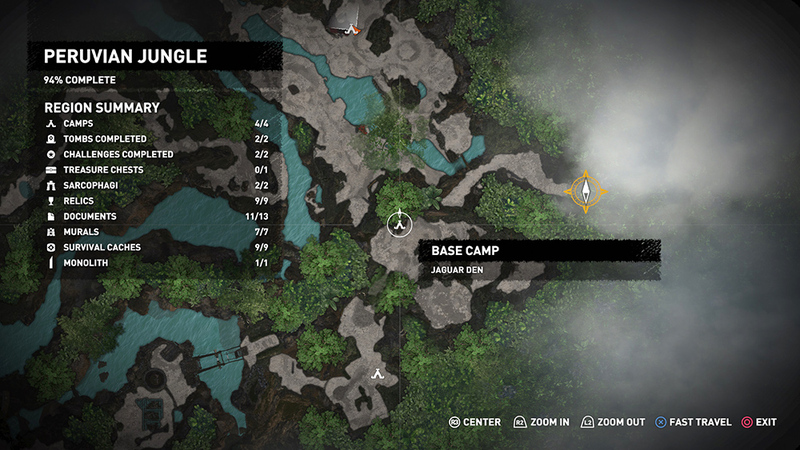 (screenshot) Move the cursor over the Jaguar Den camp and press the button indicated on-screen to to travel there. Some of the resources will have respawned near that camp, so gather whatever you need. Then head east from the campfire (screenshot) and go through the low opening on the left. 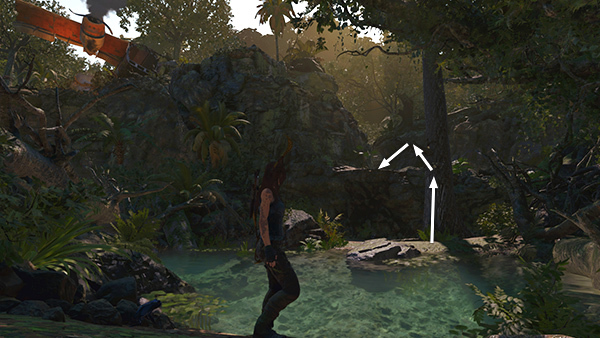 (screenshot) On the other side, follow the path to rendezvous with Jonah. You could also fast travel back to COZUMEL, which is shown above Peru on the map; however, I recommend waiting until you get the LOCK PICK. 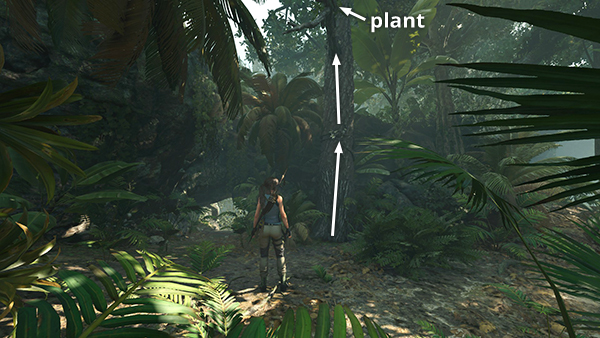 The COZUMEL walkthrough has details. CLEARING WITH SHACK: Keep following the path eastward. After a bit you'll come to a cascading stream. Jump across the water here. 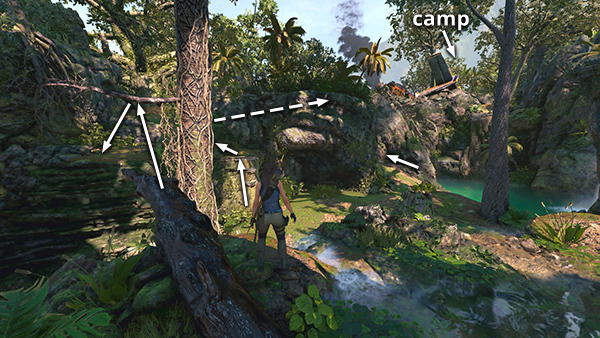 (screenshot) Explore the area surrounding the little shack to gather some salvage and wood. Pry open the door with your axe (screenshot) and enter to find another archivist map (2/2). (screenshot) If you have not already found the documents, relics, and murals nearby, they will now be revealed on your map. 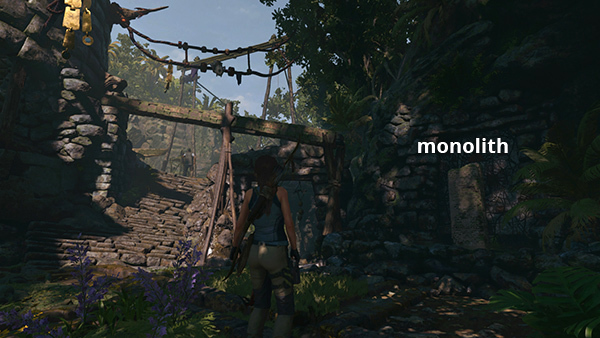 Proceed along the path to trigger a cutscene. Lara and Jonah slide down a muddy embankment and stumble upon a squad of Trinity scouts who've managed to get their vehicle stuck in the mud. Lara applies a little roadside camouflage and tells Jonah to follow her lead. NOTE: At this point you automatically unlock the Scavenger Skill Serpent's Skin (say that three times fast!) 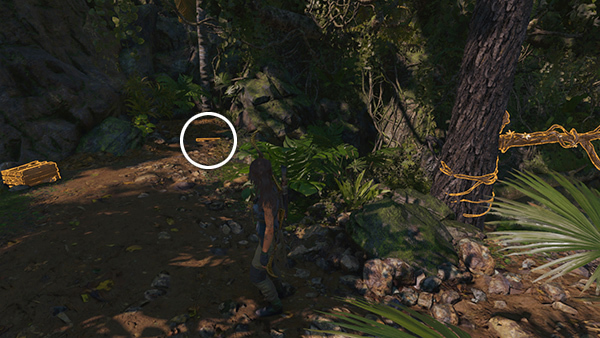 which allows Lara to use mud as camouflage. One of the men approaches from the front of the APC, so Lara and Jonah crawl under the vehicle to hide. 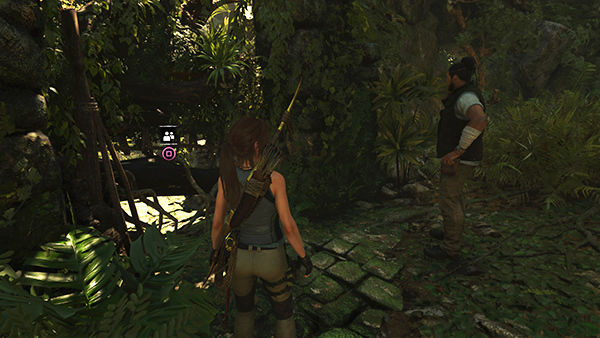 Lara and Jonah each kills one of the enemies. Then Lara tells Jonah to go to the left and she'll take care of the lightly armored soldiers. The soldier spots Lara and they struggle briefly, but Lara manages to disarm him and pull him over the edge. Jonah deals with a low-level mercenary by taking his pistol and beating him with it. After the murder spree, Lara and Jonah reminisce about their childhoods, as you do. The game announces that you now have two new weapons: the VICAR MARK II ASSAULT RIFLE and the AB .45 PISTOL. You'll have a chance to examine them more closely when you reach the next base camp. Continue through the cavern toward the village. 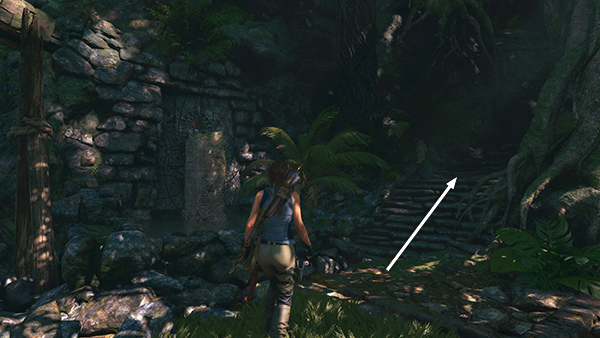 At one point, you'll need to jump across a chasm to a narrow ledge on the other side. Jonah will follow automatically. (screenshot) At the end of the tunnel is a flammable barrier. Destroy it with a fire arrow. 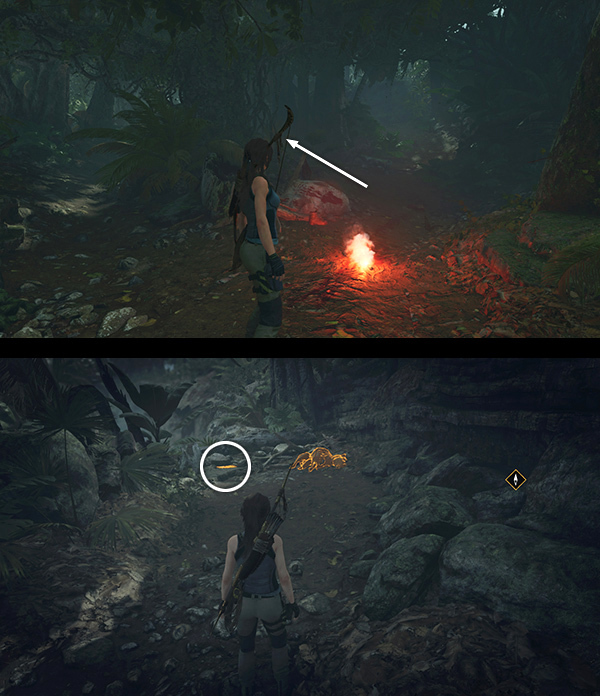 If you don't already have some, select the bow (keyboard 1 or D-Pad Up) then without aiming, hold the Alternate Fire button (Middle Mouse/R1/RB). 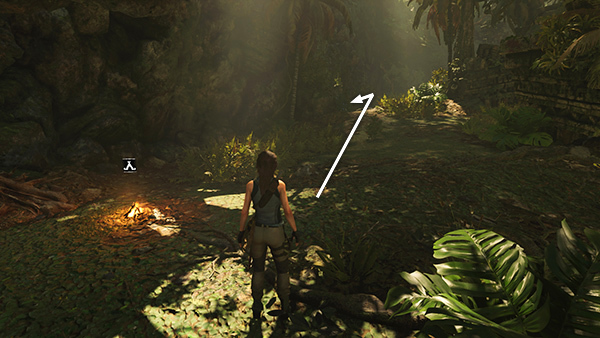 Lara will combine a regular arrow, cloth, and fat/oil from inventory to make a fire arrow. Repeat to make more. To use it, hold Aim (Right Mouse/Left Trigger), aim at the barrier with the mouse or right stick, then briefly hold Alt Fire (Middle Mouse/R1/RB) and release it to shoot. 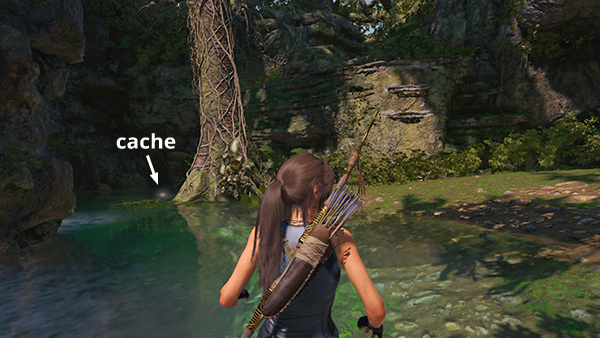 (screenshot) There are various resources, including arrows, fat, and cloth, nearby, just in case. Go through the opening into the outskirts of KUWAQ YAKU. REVISITING THIS LEVEL LATER IN THE GAME: If you've done everything you can the first time through, you'll still be short of 100% completion. NOTE: This sort of item would normally be classed as a relic, but it is not counted as one of this level's 9 relics or marked as such on the map. Return to the cave opening, drop and hang from the edge, then climb back up the cliff wall the way you came. Return to the base camp and fast travel back to wherever you left off. If you missed any of the other collectibles, you can also check the map/walkthrough and Fast Travel to the nearest base camp to explore. 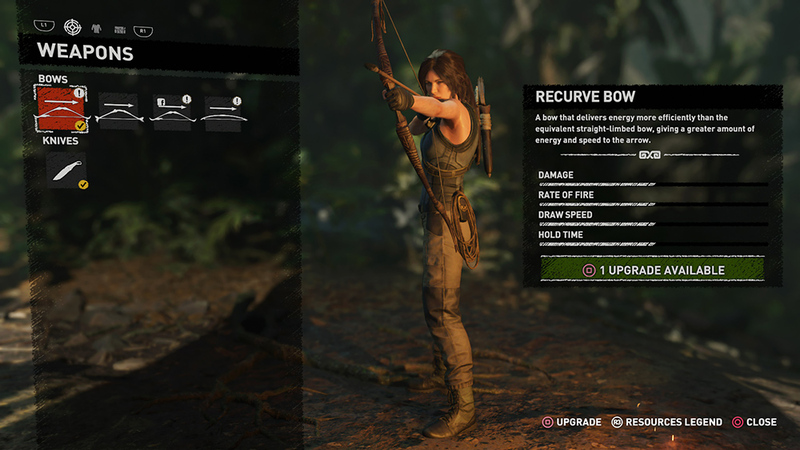 I will add a Collectibles Guide like the one in the Rise of the Tomb Raider walkthrough once the main walkthrough is done. †UPDATE HISTORY: 9/18/18 - First draft of walkthrough posted online. 9/20/18 - Added the note about unlocking the Serpent's Skin (mud camouflage) skill. 9/21/18 - Fixed a few dumb leopard/jaguar mix-ups. Thanks to Kayla for setting me straight. 9/25/18 - Fixed incorrect internal link from the area near the first base camp to the Challenge Tomb section of the walkthrough. 12/23/18 - Added info on Challenge Tomb bug and additional details about obtaining the treasure chest. JUDGE'S GAZE CHALLENGE TOMB BUG: In the PC it's possible to complete the Judge's Gaze tomb and examine the stele but not receive the Caiman's Heart skill. 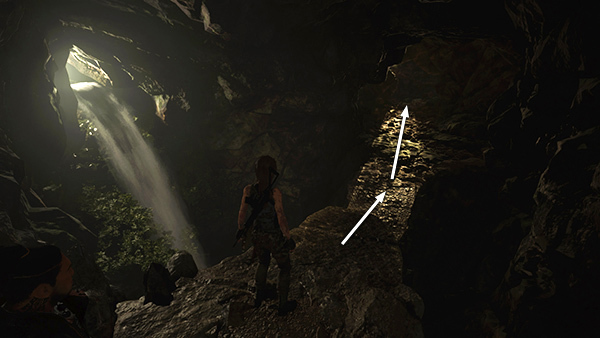 This bug seems to occur if you break down the wall and enter the side area, reach the Jungle Cavern Base Camp, leave without completing the tomb, then return later via fast travel to do so. If you complete the tomb before proceeding to Kuwaq Yaku, you shouldn't have any trouble. Thanks to Francois for playtesting this. If you've run into this issue later in the game, let me know. I may be able to provide a save file with the skill unlocked.